Yup. BIG HANDS. 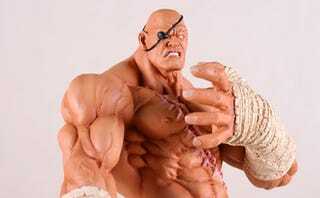 But don't let them put you off this Sagat statue by SOTA. It's not his fault, is it? Indeed, he's become quite sensitive about it, so if you don't mind, quit your staring. Due in September, it's - as you can see - a highly detailed representation of Thailand's favourite one-eyed son, stands 12" and will cost you $120.